The Nissan 350Z is a two seat sports car that was manufactured by Nissan from 2002–2009 and marks the fifth generation (codename: Z33) of Nissan's Z-car line. The Nissan 350Z entered production in late 2002 and was sold and marketed as a 2003 model. The first year there was only a coupe, as the roadster did not debut until the following year. Initially, the coupe came in base, Enthusiast, Performance, Touring and Track versions, while the roadster was limited to Enthusiast and Touring trim levels. The Track trim came with lightweight wheels and Brembo brakes, but its suspension tuning was the same as all other coupes. The Nissan 350Z has been succeeded by the 370Z for the 2009 model year. Released on August 20, 2002, the 350Z coupé was available in the U.S. in 5 trim packages: '350Z' (Base), 'Enthusiast', 'Performance', 'Touring', and 'Track' editions. In Europe only the 'Track' trim was available, although it was badged and marketed as '350Z'. 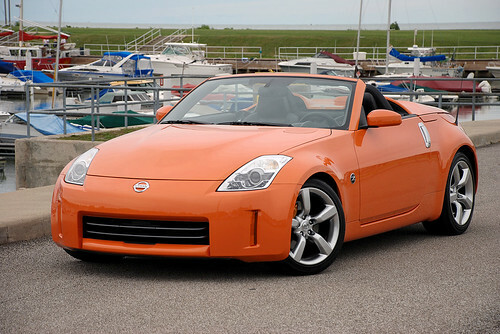 In 2004 Nissan introduced the 350Z Roadster featuring an electrically retractable soft-top roof. In the U.S. market the car was available in just 2 trim packages (Enthusiast and Touring), while in Europe, the same versions as the coupé were offered. Nissan added the Grand Touring (GT) trim to the Roadster trim packages for 2005.. In 2005 Nissan launched a 35th Anniversary edition, with a revised exterior and interior (see Special Editions below). 35th Anniversary 6-speed manual models and Track models were a mid-year introduction, and included the 300HP/260TQ Rev-up engine. Automatic transmission-equipped 35th Anniversary edition models continued with the original VQ35DE with 287HP/274TQ. For the 2006 model year, the 350Z received a number of notable changes for its mid-cycle facelift. The 300HP/260TQ Rev-up engine that was introduced mid-year 2005 with 6-speed manual was offered for every trim now. Purchasing a 5-speed automatic meant you still got the VQ35DE with 287HP/274TQ. The headlights now sported larger bi-xenon projectors, the front bumper had been revised, the rear taillights now use LEDs, and interior changes brought differences to the center console, among other small things. Touring and Grand Touring models have radio-steering controls standard, MP3 CD compatibility, and Satellite Radio became an available option. For the 2007 model year, the 350Z was again moderately revised. The VQ35DE V6 was replaced with a new, but still 3.5 L VQ35HR V6. It produced 306 hp (228 kW) at 6800 rpm with 268 ft·lbf (363 N·m) at 4800 rpm. The hood was revised featuring a bulge reminiscent of the original 240Z. In the US, trims levels were narrowed down to 350Z (base), Enthusiast, Touring, and Grand Touring, while in Europe the same trim levels remained.